Mr. Gray is an international hotelier with years of experience at a number of luxury hotels and resorts around the globe. He has experience as General Manager of Le Meridien Budapest, also a highly-ranked Conde Nast hotel, like Lotte Hotel Moscow. In his work, Mr. Gray has synthesised his diverse skills in assisting with various renovation projects, always careful to accommodate guests’ needs. His most recent previous work was at the luxury spa resort, The Modani, where he held the same role as he currently does. It was a project that demanded, in addition to standard managerial duties, collaboration with construction teams and governmental agencies. Lotte Hotel Moscow belongs to Lotte Hotels & Resorts, Korea’s largest luxury hotel chain, which is in turn part of the Lotte Group, a multi-branch holding as well as the leading conglomerate in the Asia-Pacific region. The Lotte Group takes its name from Charlotte, the protagonist of Goethe’s masterpiece, “The Sorrows of Young Werther.” Charlotte is a character beloved by readers all over the world. Inspired by her, The Lotte Group has developed into a leading Korean enterprise with a dream of filling the world with love, liberty, and life. It is now expanding further to become a company beloved by people throughout the entire world. Lotte Hotel is a new hotel, constructed in 2010. 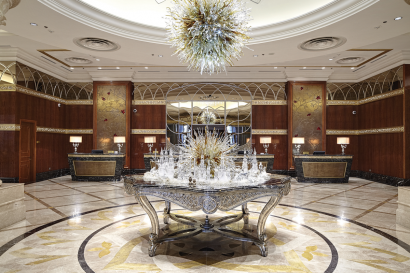 In 2015 a unique Wedding & Event Bureau was opened at Lotte Hotel. Next year, in 2016 a contemporary Italian cuisine restaurant OVO by Carlo Cracco has been opened. The addition to the hotel’s facilities was Italian Beauty Centre Aldo Coppola, opened in 2016. 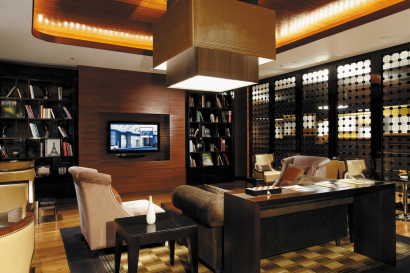 • Lotte Hotel is the only luxury Asian hotel in Moscow. 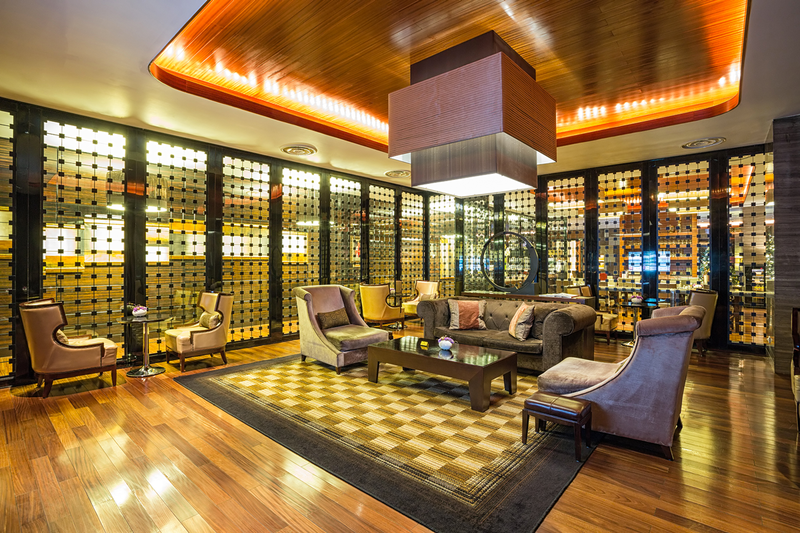 • The architectural concept and decor of the hotel were created by world-renowned design companies Hirsch Bedner Associates and Wilson & Associates. • The largest-scale investment project in the Russian market, Lotte Hotel Moscow’s construction amounted to a financial investment of over 350 million USD. • Featuring the biggest and most expensive Royal Suite in Russia. • The innovative Club Lounge offers state-of-the art office appliances, meeting rooms, and five food presentations each day. • World-famous Balinese Mandara Spa. • The Wedding & Event Bureau – Russia’s first and only luxury hotel event boutique. 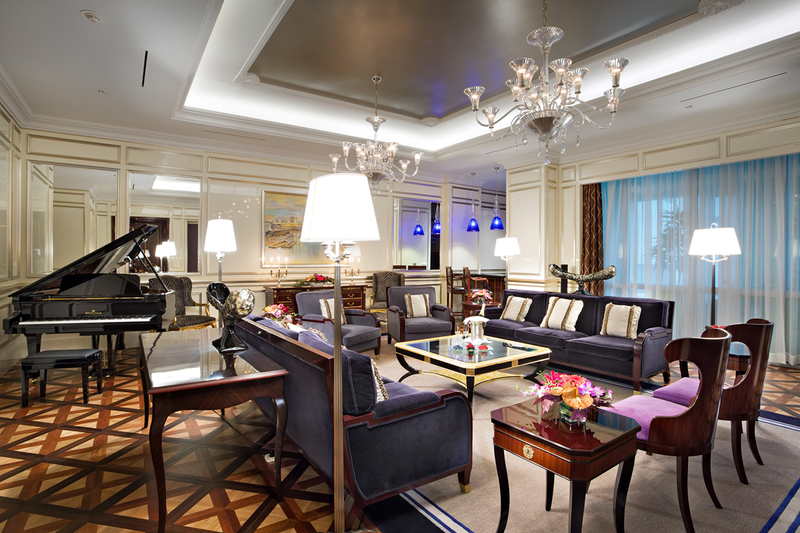 Lotte Hotel Moscow is strategically located in the centre of the Russian capital. 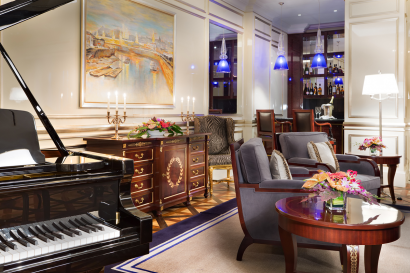 Offering easy access to business, shopping, and entertainment facilities, Lotte Hotel Moscow is only a few kilometres from the city’s main railway stations and a comfortable drive from Moscow’s International Airports. There is a legend that one of the glass carps in the chandelier at our MEGUmi restaurant is magical, able to fulfill your dreams and wishes! Dreamers who want their wish to come true should appeal to the fish by rubbing its belly with their right hand. The only conditions are that the wish should be for something positive, and that it can only be requested once a year! The next time you come to Lotte Hotel, don’t miss your chance to dream! Despite of being a luxury hotel for business travellers, Lotte is a kid-friendly hotel! All F&B outlets offer special kids’ menus with favourite delicacies. MENU Breakfast Restaurant has a special kids’ room which is available on weekends. A selection of children items, including baby cribs, bottle heaters, diapers, toys, bathrobes, and slippers are available upon request during the stay. 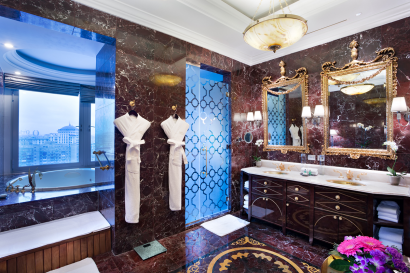 Lotte Hotel’s gorgeous rooms and suites are the most spacious of Moscow’s luxury hotels. 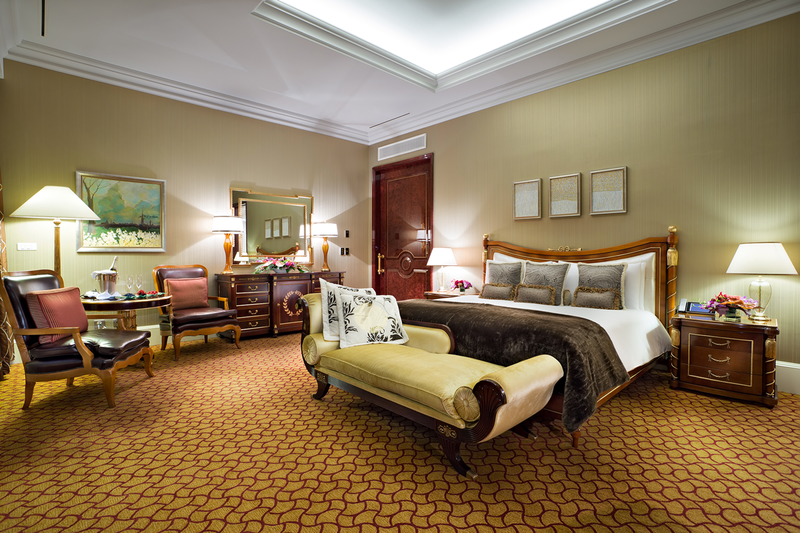 The hotel also boasts the Royal Suite, the largest suite in Russia. All rooms have extremely comfortable king-size beds, bathrooms complete with a full range of care items and exquisite bathroom amenities – either from Molton Brown or BVLGARI – and top notch equipment. 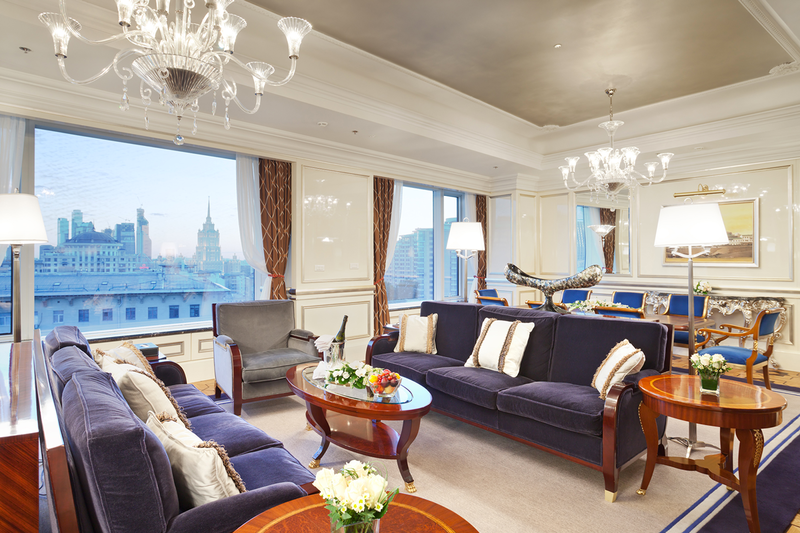 Modern lodging facilities are combined with spectacular views over downtown Moscow. • Electronic multilingual touch panels to control lighting, curtains, temperature (air and heating), alarm clock, world clock, easy-to-use telephone with services on speed-dial, easy information in-house & sightseeing, city and subway maps, music channels. • OVO by Carlo Cracco is a contemporary Italian restaurant by the legendary Michelin-starred Chef Carlo Cracco, also the TV-star of the culinary reality show Hell’s Kitchen. Chef Cracco displays his unique interpretation of the internationally beloved Italian cuisine with an a-la carte menu that’s updated seasonally, inspired by and reflecting the finest seasonal ingredients. 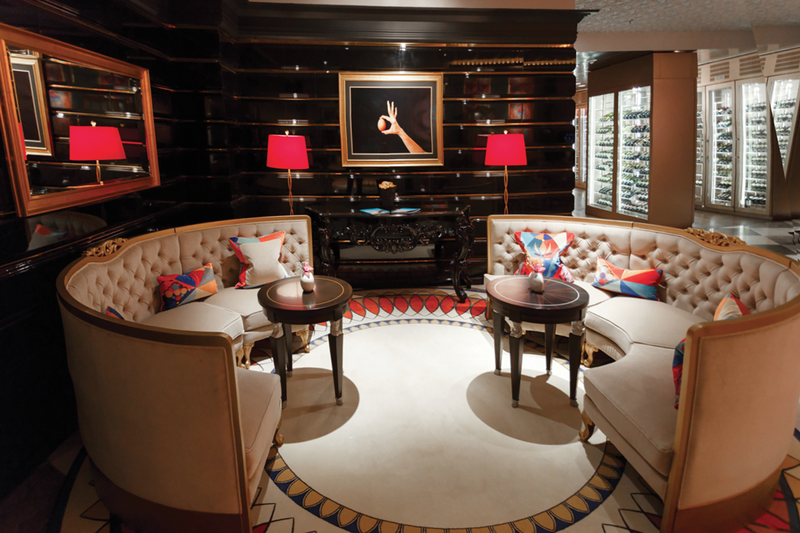 OVO additionally boasts special lunch menus with new selections of signature dishes. • MEGUmi is a cutting-edge Japanese restaurant that strives to harmonise the best and rarest ingredients from all over the world, including some ingredients that are totally unique in the Moscow market. MEGUmi also offers a wide selection of carefully cultivated Japanese sake and an aquarium of fresh seafood. 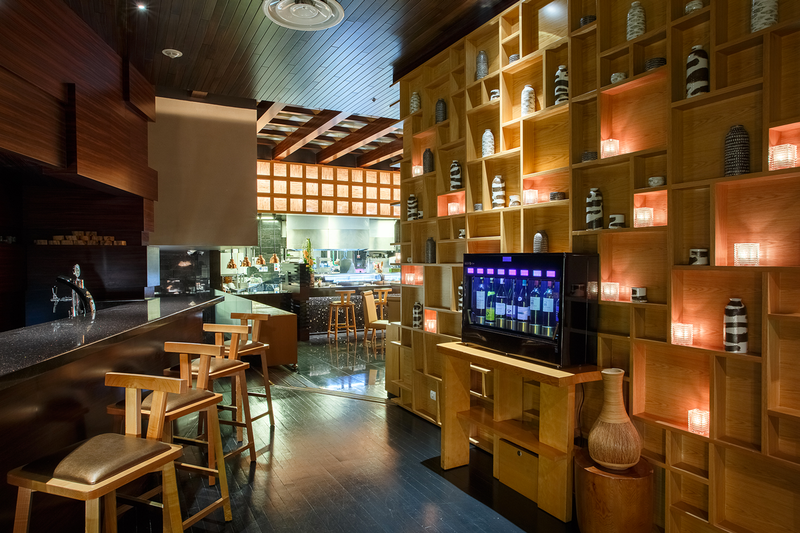 The masterful Japanese chefs’ work can be observed through the restaurant’s open kitchen. • The inviting atmosphere of The Lounge Bar offers both unique style and a diverse international menu including the most popular and beloved dishes from traditional Russian and Korean cuisines. 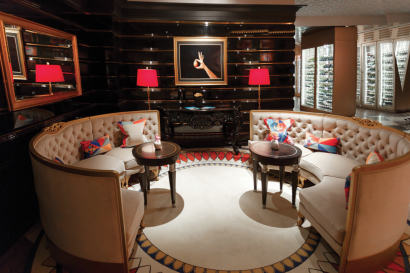 In the cosy ambience of The Lounge, guests are offered a wide range of refined tea flavours; for true tea lovers, Traditional English Afternoon Tea is served daily at the bar. The cocktail list deserves a separate mention for featuring all the most up-to-date global trends as well as a wine list that includes 250 titles from different wine regions around the world. 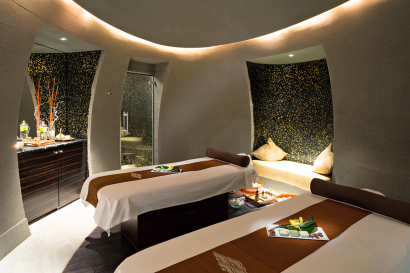 • The world-renowned Balinese Mandara Spa offers numerous massages, complex body treatments, and facials. Mandara Spa’s signature treatments are the traditional Balinese massage and the super-relaxing Four Hands massage. Guests are welcome to use the relaxation lounge and hydrotherapy area with jacuzzi, silk bath, hammam, sauna, and Russian Banya – a local traditional sauna. • The fitness club is a luxurious environment that is focused on wellness, equipped with state-of-the-art facilities, and operated by highly-trained specialists. The gym, with a total area of 180 sq m, is equipped with modern Technogym sports equipment, including cardio machines and a free weights area, and Kinesis Full Gravity innovative technology. 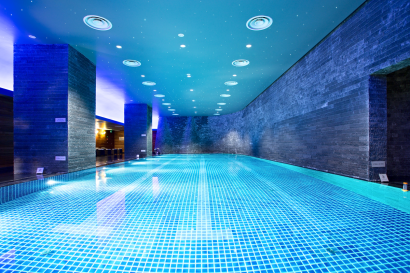 • A spacious indoor swimming pool with a relaxing ambience with changing colourful lightning, comfortable water temperature, and calm music. There is a jucuzzi on the pool site. • 6 banquet halls to accommodate any kind of event: small social gatherings, business seminars, international conventions, etc. • The unique Crystal Ballroom (600 sq m) can be easily divided into three soundproof function spaces. Each room can be used for large receptions, dinners, and wedding parties, as well as for exhibitions and workshops. Modern technical equipment allows for conferences of up to 650 people. 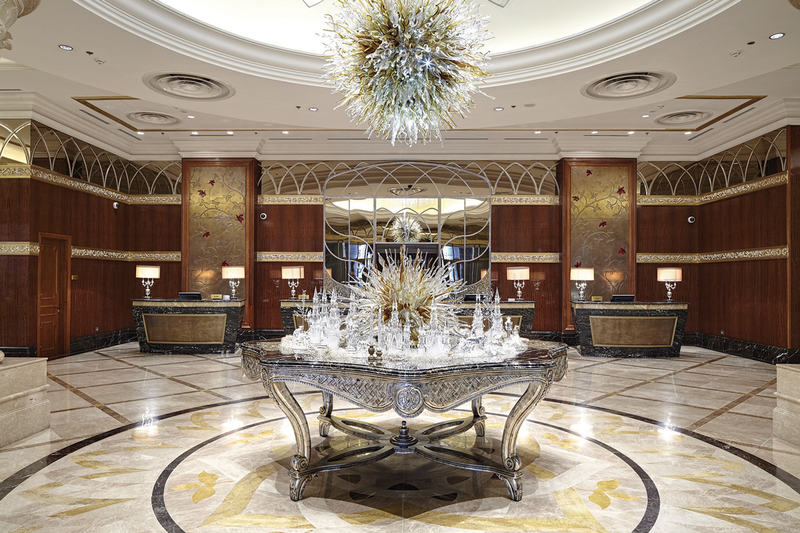 • The Crystal ballroom’s light and very spacious 1000 sq m foyer can be used for guest registration, coffee breaks, lunches, dinners, and cocktail receptions. • A 4-tonne freight lift allows for car presentation events at the Ballroom or pre-function area. • Free Wi-Fi high-speed internet access.